In the 1960s and 1970s it was common for the three big television networks (ABC, CBS, NBC) to broadcast fall preview specials shortly before the start of each new television season. These specials would showcase the new shows each network was premiering in the fall as well as returning shows, sporting events, movie nights and other programming. The specials were tied to a larger advertising campaign, reflecting a common slogan or jingle. See this article at Television Obscurities for more on the history of fall preview specials. For the 1972-1973 fall preview, CBS used the slogan “Have We Got A Fall For You” to promote its eight new programs, including The Waltons, Maude and of course, M*A*S*H. For more information on the 1972 CBS fall preview special, see this article at Television Obscurities. Due to the timely nature of fall preview specials, they are never rebroadcast. Thus, the M*A*S*H fall preview went unseen for more than three decades before it was made available here. This preview, which runs two and a half minutes, was one of the first introductions to M*A*S*H for most viewers in 1972. Together with other television promotion as well as print and radio advertising, it is what sold the show to the viewing public. The preview uses footage from the pilot episode only, including much of the extended opening sequence (a scene later cut in syndication). The theme music is played throughout the preview, although the rendition used is not the same version that appeared in the opening credits. It is a softer version, with a horn section. The famous shot of Radar standing with the mountains in the foreground transitions into equally famous shots of the helicopters delivering wounded. The announcement calling all personnel to admitting ward and operating room is heard and then scenes of much activity in the compound are shown: the nurses running from their tents, personnel rushing up to the helipad, a dog yapping. Without the cast credits superimposed over the image, this is a rare opportunity to see everything going on in these scenes. A number of scenes from the pilot are then shown: Hawkeye joking in the OR; Hawkeye mouthing off to General Hammond; Hawkeye and Trapper putting together the raffle; General Hammond threatening to court martial Hawkeye and Trapper. At the end of the preview, the helicopters are shown again and the music fades out, with M*A*S*H lingering momentarily on the screen. Notice that Lt. Dish (Karen Philipp) and General Hammond (G. Wood) are featured heavily in the preview, despite having only limited roles in a handful of episodes during the first season. George Morgan, who played Father Mulcahy only in the first episode, is also shown in the preview. Footage from the first episode was likely all that was available for use in the fall preview. Later fall preview specials would often include M*A*S*H in their overviews of returning programming. For example, the 1974 CBS fall preview special (which used the slogan “See The Best On CBS”) and was hosted by Ted Baxter who, before introducing the new shows, conducted mock interviews with stars of returning shows and M*A*S*H was featured prominently. He would pose questions and then clips from the shows would show responses. 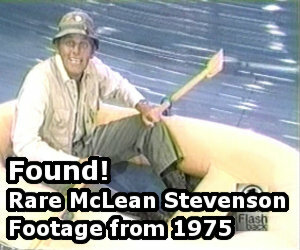 Various characters from M*A*S*H were seen in this segment. I am so glad for reruns on me-tv! Hooray for 6 o’clock M*A*S*H hour! I love the entire show. Now that it has been on Netflix is even better. Me and my 13 year old son have watched every episode. This is a very well and professionally put together site. Was there ever a TV episode where some of the lyrics to the theme were sung? How many seasons did the opening use shots of the choppers from the opening of the movie?